I hear a lot of players talking about how they hit the ball well on the range, but can't do it on the golf course. I think that there is probably a simple explanation for it. Most people don't practice like they play. I see players who never hit a shot on the range using their normal preshot routine and then go to the golf course and use an elaborate 45-second routine. 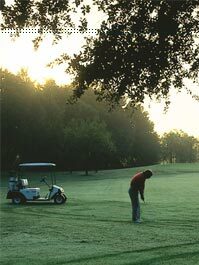 The preshot routine should be developed and honed on the range and the putting green before put to work on the course. A consistent preshot routine can be a player's greatest asset to help focus the mind, instill confidence, and eliminate distractions. It should be simple and tailored to a player's preferences, but still achieve those three objectives. Your routine should be relatively short and simple, but should consist of the following ingredients. Specific Plan - How do you want to play the shot? Pick out a specific target and then the club needed to best execute the shot. Positive Image - Visualize yourself hitting the shot that you want. Rehearsal - Take a practice swing trying to feel the tempo needed to carry out a successful shot. Target Focus - You must have a target and have your body aligned properly to it. The closer you are to the execution of the shot, the more your focus should be on the target. Execution - A good routine allows you to trust the swing and let instinct take over.